It was the summer of 1990. As Indian Railway (Traffic) Service probationers, my friend and I travelled by train from Lucknow to Delhi. Two MPs were also travelling in the same bogie. That was fine, but the behaviour of some 12 people who were travelling with them without reservation was terrifying. They forced us to vacate our reserved berths and sit on the luggage and passed obscene and abusive comments. We cowered in fright and squirmed with rage. It was a harrowing night in the company of an unruly battalion; we were on edge, on the thin line between honor and dishonor. All other passengers seemed to have vanished, along with the Travelling Ticket Examiner. We reached Delhi the next morning without being physically harmed by the goons, though we were emotionally wrecked. My friend was so traumatised she decided to skip the next phase of training in Ahmedabad and stayed back in Delhi. I decided to carry on since another batch mate was joining me. (She is Utpalparna Hazarika, now Executive Director, Railway Board.) We boarded an overnight train to Gujarat’s capital, this time without reservations as there wasn’t enough time to arrange for them. We had been wait-listed. Indian Railways Enquiry system can be used to conveniently check wait-listed tickets. Easily get Indian Railways Enquiry, train timetable, PNR Status and more from the system. This service of the Indian Railways Enquiry system should be strengthened by providing calling and SMS facilities in special scenarios. Through this, the Indian Railways Enquiry provides passengers with the simplest way to get Railways Information for any of your journey. We met the TTE of the first class bogie and told him how we had to get to Ahmedabad. In such a scenario, Indian Railways Enquiry system would play a vital role in providing features to be used during any situation. The Indian Railways Enquiry is extensively used by commuters to book tickets before travelling. The Indian Railways site offers services like check PNR Status, IRCTC/ Indian Railways Enquiry, and several other features. The train was heavily booked, but he politely led us to a coupe to sit as he tried to help us. I looked at the two potential co-travellers, two politicians, as could be discerned from their white khadi attire, and panicked. “They’re decent people, regular travellers on this route, nothing to worry,” the TTE assured us. One of them was in his mid-forties with a normal, affectionate face, and the other in his late-thirties with a warm but somewhat impervious expression. They readily made space for us by almost squeezing themselves to one corner. They introduced themselves: two BJP leaders from Gujarat. The names were told but quickly forgotten as names of co-passengers were inconsequential at that moment. We also introduced ourselves, two Railway service probationers from Assam. The conversation turned to different topics, particularly in the areas of History and the Polity. My friend, a post-graduate in History from Delhi University and very intelligent, took part. I too chipped in. The discussion veered around to the formation of the Hindu Mahasabha and the Muslim League. The senior one was an enthusiastic participant. The younger one mostly remained quiet, but his body language conveyed his total mental involvement in what was being discussed, though he hardly contributed. Then I mentioned Syama Prasad Mookerjee’s death, why it was still considered a mystery by many. He suddenly asked: “How do you know about Syama Prasad Mookerjee?” I had to tell him that when my father was a post-graduate student in Calcutta University, as its Vice-Chancellor he had arranged a scholarship for the young man from Assam. Suddenly the senior man proposed: “Why don’t you join our party in Gujarat?” We both laughed it off, saying we were not from Gujarat. The younger man then forcefully interjected: “So what? We don’t have any problem on that. We welcome talent in our State.” I could see a sudden spark in his calm demeanour. The food arrived, four vegetarian thalis. We ate in silence. When the pantry car manager came to take the payment, the younger man paid for all of us. I muttered a feeble ‘thank you’, but he almost dismissed that as something utterly trivial. I observed at that moment that he had a different kind of glow in his eyes, which one could hardly miss. He rarely spoke, mostly listened. The TTE then came and informed us the train was packed and he couldn’t arrange berths for us. Indian Railways Enquiry should be designed such that it can assist any passenger in the event of an emergency situation. Passengers can also use it for checking all types of Indian Railways Enquiry. The Indian Railways Enquiry provides results in few seconds without consuming bandwidth. Both men immediately stood up and said: “It’s okay, we’ll manage.” They swiftly spread a cloth on the floor and went to sleep, while we occupied the berths. What a contrast! The previous night we had felt very insecure travelling with a bunch of politicians, and here we were travelling with two politicians in a coupe, with no fear. We thanked them for that invitation and assured them that accommodation was not going to be a problem for us. Before the train came to a stop, I pulled out my diary and asked them for their names again. I didn’t want to forget the names of two large-hearted fellow passengers who almost forced me to revise my opinion about politicians in general. I scribbled down the names quickly as the train was about to stop: Shankersinh Vaghela and Narendra Modi. I wrote this episode in an Assamese newspaper in 1995. It was a tribute to two unknown politicians from Gujarat for giving up their comfort ungrudgingly for the sake of two bens from Assam. When I wrote that, I didn’t have the faintest idea that these two people were going to become so prominent, or that I would hear more about them later. 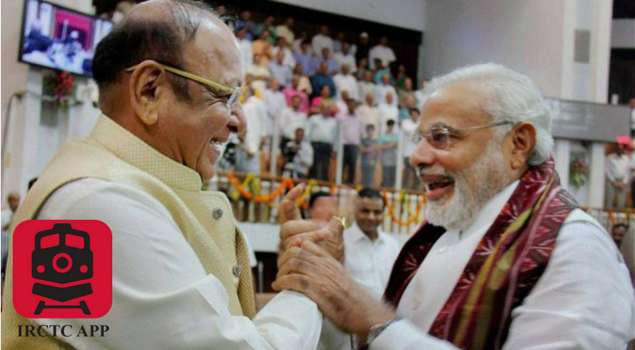 When Mr. Vaghela became Chief Minister of Gujarat in 1996, I was glad. When Mr. Modi took office as Chief Minister in 2001, I felt elated. And now, he is the Prime Minister of India. Every time I see him on TV, I remember that warm meal, that gentle courtesy, caring and sense of security that we got that night far from home in a train, and bow my head.